Despite the fact that I have lived in Ottawa for 3 years now, I still haven’t found a go-to bubble tea place that is both delicious and reasonably priced. Recently, my mom suggested that I make my own. She kindly made a trip to T&T and bought me the tapioca bubbles for bubble tea. I followed the instructions on the packet and added it to my favourite iced teas – I’m hooked on the result! Dried tapioca balls – not the quick cook ones! You can get these from Asian grocery stores or online. A wide straw – I ordered mine on eBay here! To make the tapioca, boil a pot of equal parts water and sugar. This will make the simple syrup to preserve the tapioca. Set it aside in your container. Fill the pot with water again and bring it to a boil. Pop some tapioca in there and let boil on medium heat for 15 minutes, stirring occasionally so they don’t all clump together. Turn off the heat and cover the pot. Let the tapioca sit for another 15 minutes. Drain them and pour them into your container of simple syrup. Refrigerate until they’re cold. To make your tea, choose your favourite type and brew a double-strong cup of it (meaning you add twice as much tea as you normally would). Put some ice (and, if you like, milk) into your watertight cup, martini shaker, or jar. Pour your tea into it once it’s done brewing. Sweeten your tea with some of the simple syrup from your tapioca, but don’t add your bubbles in yet. Close the lid and shake. You can now decant your tea into a glass or drink it straight from your shaker. Add a few tablespoons of tapioca, place your straw in your cup, and enjoy! 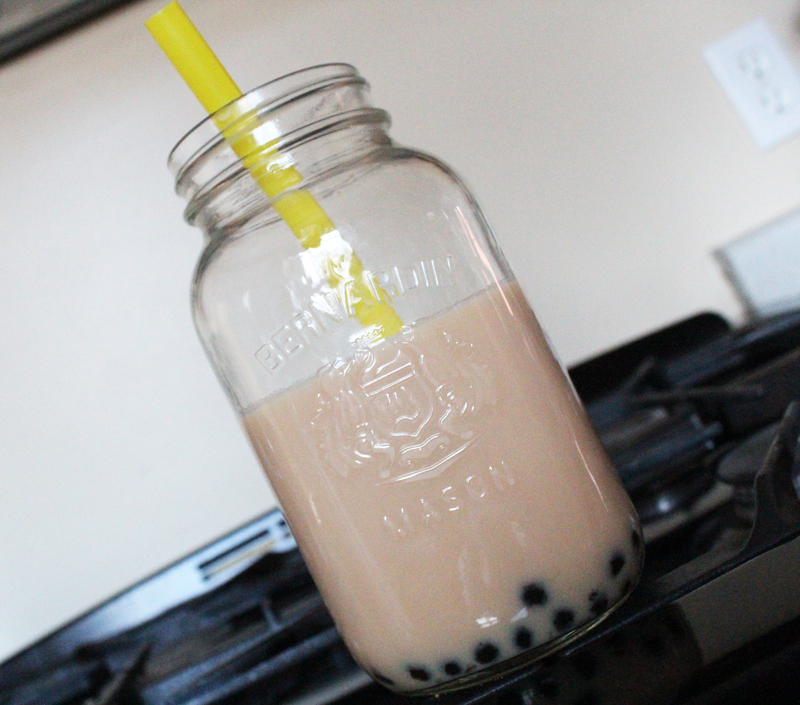 I love bubble tea and probably drink it about daily. It’s so much less expensive to make it at home, and just as good! Your tapioca will last a few days in its simple syrup before it starts to get a little too hard to eat.